Can Integrating Civil Resistance and Peacebuilding Strategies Improve Movement Effectiveness? Do the distinct approaches of civil resistance and peacebuilding complement one another, and if so, how? What are the implications for the ongoing work of activists, scholars, and policy makers worldwide? 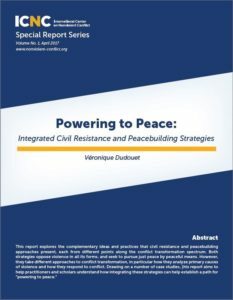 Having published ICNC’s inaugural Special Report, Powering to Peace: Integrated Civil Resistance and Peacebuilding Strategies by Véronique Dudouet, earlier this year, we are offering this November 15 webinar to further explore Dudouet’s groundbreaking findings, focusing on the concrete points of intersection between the fields of nonviolent conflict and peacebuilding for improving the effectiveness of popular movements for rights, freedom, and justice. 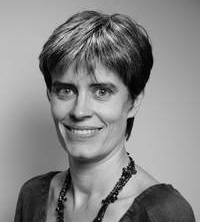 Dr. Véronique Dudouet is senior researcher and program director at the Berghof Foundation in Berlin. She has been coordinating participatory action research, training and policy advice activities on resistance and liberation movements in transition’ since 2005. She holds an MA (2001) and PhD (2005) in Conflict Resolution from the Department of Peace Studies, Bradford University, UK, as well as an MPhil in International Relations and Security and a BA in Political Science from the Institute d’Etudes Politiques, Toulouse, France. Her current research interests include transitions from armed to unarmed insurgencies, the role of external actors in nonviolent resistance, negotiation and third-party intervention in asymmetric conflict, inclusive post-war governance. As a scholar-activist, she has been involved in several anti-war and nonviolent campaigns, including as a volunteer with the International Solidarity Movement (ISM) in the Palestinian territories. She also carries out consultancy projects for various civil society organizations, state and international agencies (EU, OECD, UNDP). Besides numerous publications in the fields of conflict transformation and peacebuilding, she has published numerous book chapters and academic articles on civil resistance, as well as a co-authored report (with Howard Clark, 2009) for the European Parliament on Nonviolent Civic Action in Support of Human Rights and Democracy, and an edited book on Civil Resistance and Conflict Transformation: Transitions from Armed to Nonviolent Struggle (Routledge 2014).